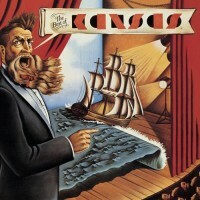 Kansas is one of the great prog bands that I somehow lost track of early in the game and I regret it to this day. In 1975 I purchased and really liked the "Song for America" album but, for some reason, I didn't buy "Masque" when it came out later that same year. Perhaps someone whose opinion I respected steered me away from it or maybe there was just always another LP that I chose to take home from the record store instead (I was heavily into Jazz Rock/fusion about that time). Anyway, when I saw this offered for a very low price online recently I figured it was time to spring for what the group considers to be their best material and I'm glad I did. The CD starts with a bang. The remastered "Carry On Wayward Son" sounds like a million bucks and then they jump right into the exemplary "Point of Know Return." These two songs are stellar examples of intricate yet accessible progressive music and they both went a long way in keeping the candle of intelligent rock and roll aflame as radio was gradually turning into a disco inferno in the mid 70s. Everything about these back-to-back hits is top notch and every serious progger in the world should have them in one form or another. "Fight Fire with Fire" isn't a bad tune per se but it sounds a lot more like Loverboy or Starship than Kansas and inherently reflects the glossy MTV mindset that had infected the business when it came out in 1983. The classic ballad "Dust in the Wind" follows and there's a good reason why it has lasted despite its fatalistic, sobering lyric. A simple but memorable melody backed by superb musicianship is the secret to any great hit song and this one reached as high as #4 on the singles chart. "Song for America" is the best track this group ever recorded and it has never sounded better than it does here. I could go on and on about how fantastic it is but I will instead refer you to my review of the album by the same name in the archives if you need more proof of my admiration. Needless to say, this epic alone is more than enough reason to get this disc. "Hold On" is the next cut and it's an inspiring song about hope and faith where vocalist Steve Walsh really shines. "No One Together" has excellent musicianship throughout but the tune itself about the need for unity is uncharacteristically short on their usual dynamics. "Play the Game Tonight" is another excursion into the slickness of the 80s that features the singing of John Elefante. It sounds a whole lot like Styx to me but in a good way, I guess, because the tune isn't a total turn-off. "The Wall" is first-rate all the way with the band streaking along in its mid 70s creative stride and "The Pinnacle," despite being a bit contrived, makes me think I really missed the boat when I didn't go ahead and get the "Masque" LP back in '75. I might have become a die-hard fan. Both songs are wonderful examples of progressive rock and a joy to listen to. Their frantic "The Devil Game" is one of the most energetic and exciting numbers from their early years and I'm glad it's included in this compilation. "Closet Chronicles," though, is only okay considering the fact that it's a live performance but the tune is a little too long-winded and overly dramatic to be effective. As "Best Of" extravaganzas go, this one is top shelf and one that supplies an honest, representative overview of this underrated American band's extensive repertoire. Since I'm not familiar with their deeper album cuts it allows me to discover some excellent songs that are new to me and still enjoy their most popular tracks at the same time. It's a win-win situation. 4 stars.